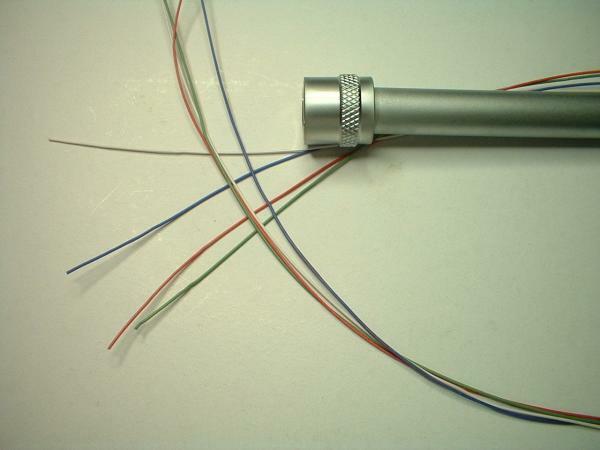 Tonearm wire has two basic requirements. One, it must be flexible. Tonearm wire must not interfere with the motion of the arm. Interfering with arm motion can introduce low level distortions that obscure fine details. Two, it must be a top quality conductor, preferably Litz copper. KAB would not have entered the wire making business if it weren't for the lack of tonearm wire meeting those 2 basic requirements. I have rewired hundreds of Technics arms over the years. And have come to the conclusion that the companies making "tonearm wire" have never actually rewired a tonearm. For if they had, they would immediately realize that Teflon is perhaps the least desirable insulation. First and foremost, tonearm wire must be flexible, and you cannot get there with Teflon. And, worse yet, Teflon requires a graphite coating to eliminate the triboelectric charge that occurs with motion. This charging and discharging is what causes microphonics with Teflon wires. But there is a better way. So, after many years, I am very excited to finally introduce a tonearm wire made for people that actually rewire tonearms and play records. KAB SuperFlex Litz tonearm wire. Each 34 gauge wire is made up of 40 strands of 50 gauge pure copper litz conductors enveloped in a very thin film of super flexible silicone. Our new tonearm wire lays as limp as a wet noodle! It will not interfere with tonearm motion in any way. It will not resonate in the audio band. It will not develop a static charge nor create microphonics with motion. KAB SuperFlex is the definition of tonearm wire. Sold in sets of 4 colors Red, Green, Blue and White. KAB SuperFlex tonearm wire should be stripped with a good quality mechanical wire stripper. Then lightly twirl the strands between your fingers. Now, pre tin them by simply applying a soldering iron and solder, The poly film will bubble off and the wires will tin very quickly. The wire is a joy to work with, really. Just remember that the high degree of flexibility requires that you handle the wires lightly. Do not stretch or tug on them. We can make custom wire sets pre cut and tinned as well. Also, check out our SpiralAir Interconnects. They are a perfect match for an arm rewired with our SuperFlex Litz tonearm wire. KAB SuperFlex Litz tonearm wire is sold by the linear foot. Set Quantity to the length you require. 5 mil Super Flexible Silicone Insulation. Silicone insulation has ultra flexibility which ensures that your tonearm reveals it's maximum sensitive to stylus motion. Silicone insulation is stable and will not harden over time. Because of it's supreme flexibility, Silicone insulation eliminates audio band resonance and tribo electric charge, Graphite coating is not required. Making KAB ultra flexible tonearm wire a very quiet wire. The dielectric is the insulator. Insulators are assigned a number that describes the reduction in wave propagation speed through it. For example, air is 1, Teflon is 2, thin silicone is 3, PVC is 3.4, water is 80. That is the dielectric constant 2/. And it is only meaningful if both send and receive conductors are immersed in the same dielectric, and if the cable is long enough to contain a quarter wavelength. Many websites spin long yarns about how audio waves propagate through cables. And by the time you wade through it all, your thinking to yourself, Wow, this must be really important! But while it is true that higher dielectric constants will reduce the speed that a wave travels down the wire, it is important to consider that audio is measured in milliseconds, cable velocity effects are measured in nanoseconds. That's a ratio of a million to one! I found one reference that really nails this down: "If a long line is considered to be one at least 1/4 wave in length, you can see why all connecting lines in low frequency systems are assumed short. For a 60 Hz AC power system, power lines would have to exceed 775 miles in length before the effects of propagation time became significant. Cables connecting an audio amplifier to speakers would have to be over 2.3 miles in length before line reflections would significantly impact a 20 kHz audio signal! " 1/ Now imagine the impact 3 ft of interconnect has on velocity? Now, capacitance per foot is still important, But this will only come into play in complete cables, not loose wires laying inside a tonearm wand. The total contribution there being a few pico Farads. I have found that the most neutral sound will come from pure copper. This makes sense if you understand skin effect. The skin effect describes how higher frequencies currents tend to crowd into the outer edges of the conductor. If you plate the copper, you introduce skin effects that affect the treble quality. Tin plate will lose detail, Silver plate will enhance detail. Our general recommendation is not to use plating in wires that are not easily removable. And to not use plated conductors at all if you are interested in neutral reproduction. Litz wire describes a construction that attempts to optimize transmission efficiency across a wide range of frequencies. It does this by reducing the skin effect. 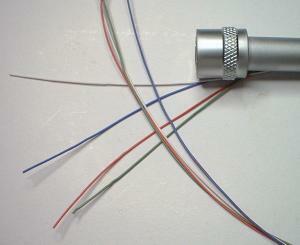 A litz wire will be made up of many strands of wire, each strand individually insulated. The diameter of each strand is chosen to ensure that at the highest frequency, the electrons occupy the entire cross section of that strand. The strands are then bundled together to achieve the desired gauge and wound in a special pattern that ensures that each strand appears on the outer edge of the conductor, repeating over and over as the wire is produced. The advantages of Litz wire are many and I can think of no disadvantages. KAB SuperFlex Litz Tonearm Wire.